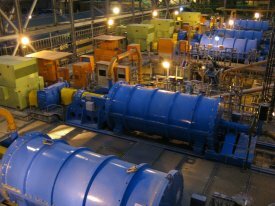 Xstrata Technology’s IsaMillTM, the energy efficient grinding technology has been selected for the Xstrata Copper’s recently approved Las Bambas Project. The project, owned and operated by Xstrata Copper, is located in the Apurímac Region of Southern Peru, and will be one of the biggest greenfield copper mines to come on stream globally in the next decade. Xstrata Technology will provide three M3000 IsaMillsTM in the regrind circuit of the new concentrator. Each mill will be powered by 1500 kW (2000 hp) motors and will use ceramic media. The new concentrator will be designed to treat 140,000 tonnes per day in a two line operation and will initially produce 400,000 tonnes per annum copper in concentrates. The IsaMillsTM will be included in the concentrate regrinding circuit, and like Xstrata Copper’s Antapaccay installation, will incorporate Xstrata Coppers’ standard concentrator design concept. Bob Drabik Executive General Manager of Xstrata Copper Project Development South America said: "We have chosen IsaMill technology for our Antapaccay and Las Bambas projects in southern Peru because of the equipment’s energy efficiency and ability to deliver a precise size distribution curve with minimal over-grinding which in turn helps to reduce excessive circulating loads. A primary consideration when developing our new projects is to seek ways to minimize our environmental footprint and IsaMillTM technology helps us to achieve this due to its efficient energy usage and smaller size than other comparable mills." Mr Stephen Schmidt, Operations Manager - Mineral Processing, Xstrata Technology, said the IsaMillsTM are being supplied as a full package, where Xstrata Technology will be responsible for the supply of the IsaMillsTM, steelwork, feed and discharge pumpboxes, as well as the new proprietary IsaChargerTM media transfer system. Importantly the M3000 IsaMillsTM will include the new High Flow design that permits high tonnage throughput, and still delivers superior energy efficiency. The commissioning of the mills is planned for 2014. Xstrata Technology will manage the project from its Vancouver office, as well as providing project support and commissioning services from their Santiago office, who are also working on the two M3000 IsaMillsTM that are to be used for Antapaccay project.